I think we'll all be glad to know this is the last part of my 20th birthday celebrations! I'm writing a book about how people discover music online - particularly in the age of Last.fm, wikis, blogs etc. […] It's called Net, Blogs and Rock'n'Roll. One of the things I'm covering is fan-generated information and fan communities. […] I was wondering if I could steal an hour of your time at some point to chat over your 12-year experience with the Galaxie 500 website and email list. So a short time later we met in a pub in Shepherds Bush for a chat, I wittered on not convinced that I really had anything to say but it was a nice evening and after it I headed home. In August 2007 the book was published and is a fantastic and insightful look at online and digital music (and re-reading it recently it's still has a lot of relevance seven years on in a fast moving world. Chapter 3 is called "Fans as creators" and has a fascinating assessment of the value of fans in the online. [Fan communities] develop a shared way of working together, what leading theorist Etienne Wenger calls a "shared repertoire of resources: experiences, stories, tools, ways of addressing recurring problems." In the case of the Galaxie 500 community, this would include when (and how) to use the server, experiences of previous "flame wars" on the email list and how they were resolved, the ethical codes of what is and is not legitimate digital copying, together with shared memories of meet-ups at gigs and which albums have topped the fans’ polls over the years. David wrote up our pub chat for his website. You can possibly still get copies of the book on Amazon or eBay. I'll throw "Dear Paulina" in here but I've sort of milked that to death over the years - so go here to see the story (and hear the single). When Luna announced their last shows in NYC I resigned myself to the fact that I wouldn't be there - there were plenty of reasons, none of them were that good, the best was the miles and the cost. The fact that they were coming to London on the farewell tour was the clincher. Members of the mailing list decided differently and a collection was started and a lot of lovely folk contributed and plans were afoot to go. On 26 December 2004 there was a undersea earthquake off the coast of Sumatra, the ensuing tsunami killed hundreds of thousands, left millions homeless and put many at risk... and what the west had that these people needed was money... and what I couldn't contemplate was spending money on myself when this was happening. After consulting the donors I took their money, added a chunk of my own, and decided that the last London date would be the last time I'd see Luna. I love that these friends cared enough to try and get me over - and it does worry me that my not going was rude - but given the scale of the disaster I felt it was the least I could do. 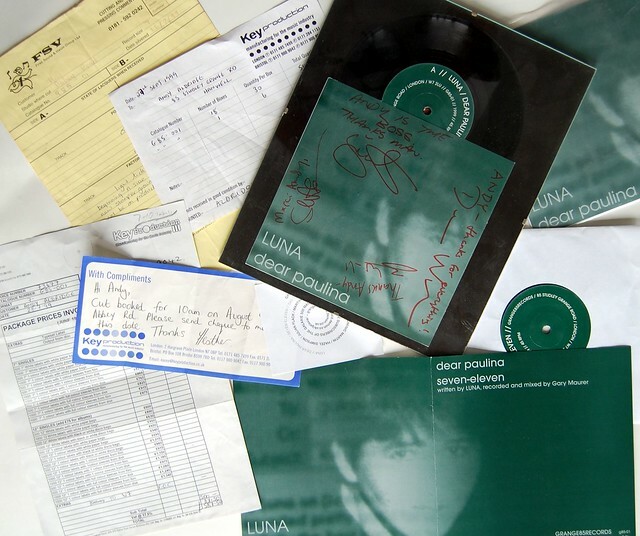 I lived Luna's final shows through the internet, and through my friends who were there. Of course I should have been there. At some point someone on the mailing list suggested we do a tribute album and so I took it upon myself to organise that - but, as previously mentioned, I couldn't really organise a piss-up in a brewery, so almost two years later - a half-arsed CDR with a laser-printed paper sleeve finally made its way into the big-wide-world. It deserved better... much better. So... A Head Full of Wishes moves into its third decade with a new Damon & Naomi LP in February, a Luna reunion in April, and hopefully, more opportunities to meet fans at gigs and festivals, in pubs and coffee shops, online and offline. It's been a treat - and while meeting the band members over the years has been a thrill meeting other fans has been brilliant - sometimes awkward - but always brilliant.